Valtra’s roots can be traced date back to the 1830s, but it was virtually unknown here or in the UK until the early 1990s – despite making tractors since 1951. Valmet (Valtion Metallitehtaat) was formed in post-war Finland, from the remains of the Finnish artillery and weapons industry. It set about making industrial machinery and printing presses, as well as tractors, using former gun-making equipment. 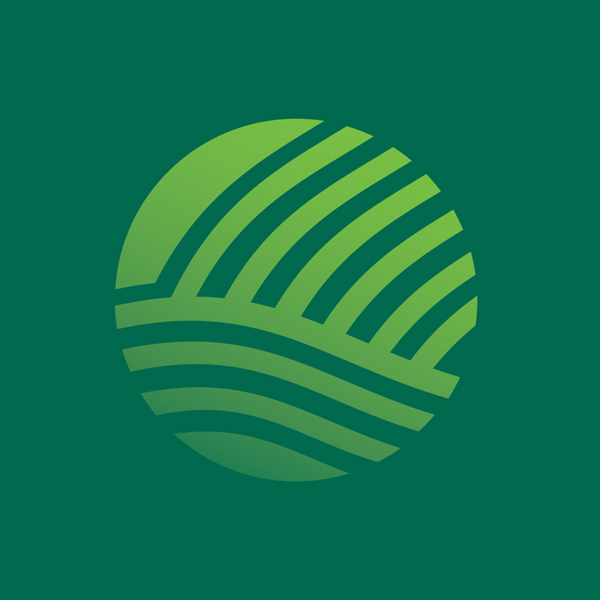 Exports started in 1958 and a production facility was opened in Brazil in 1960. In 1979, Valmet purchased the Volvo BM tractor business. It got its first real showing here in Ireland at the 1994 National Ploughing Championships, with Irish sales starting in earnest in 1995. 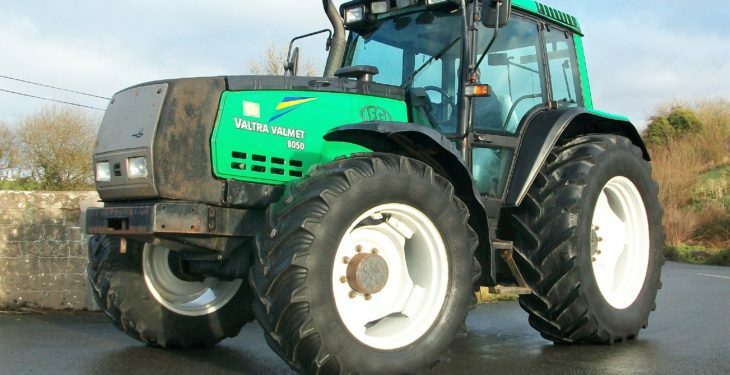 In 1998, the Valtra name was introduced; the ‘Valtra/Valmet‘ dual name was used for a time. The 8050 Mega model was launched in 1995, with minor upgrades from the previous 8000 series. Designed for tough Artic conditions from the outset, the engine and transmission are joined by a load-bearing fuel tank which forms the central chassis of the tractor. However, optional larger fuel tanks were fitted behind the steps on some tractors. With a nod to forestry, the entire belly of the tractor is flat, with the 4WD prop-shaft completely hidden by the fuel tank/chassis. All pipes and sensors are on top of the transmission and even the hitch is incorporated into the back-end casting – to help prevent damage from tree stumps. Weighing in at just over 5t – lightweight for their size – many of these Valtra/Valmet tractors found use in turf and peat milling in the Nordic market. Due to their design, extra weight is easily added if needed. With 4WD and a Sisu 110hp (DIN) six-cylinder turbo-charged engine (displacing 6.6L), this under-stressed powerplant has a reputation for clocking up huge hours with minimal issues. This was initially coupled to a manual shuttle, dry-clutch, 36-speed transmission with a three-speed ‘Delta’ powershift. 4WD and PTO engagement is electric on all models, with manually selectable 540/1,000 PTO speeds. The 8050 model has an electronically-controlled lift system with a capacity of 5.6t, but Mega and HiTech models could handle almost 7t. In 1998, the HiTech variant arrived; it offered a combined left-hand power-shuttle (stubby) lever and handbrake. Other HiTech features included an automatic powershift gear-change function and push-button clutch actuation. A digital pillar display also became available. The AutoTraction selectable automatic clutch feature on HiTech models allows the clutch to disengage automatically, when engine revs drop or when the brake pedals are pushed. A long options list was available with a range of colours or features – such as reverse-drive (fitted in the factory). With a short wheel-base and an unusual 60-40 weight distribution, grip levels and manoeuvrability are very good, but this design can lead to ‘bounce’ at road speeds. Comfort is increased with the front axle air suspension system, which was also an option across the range. It uses two truck-style air bags and an engine-driven air compressor. The cab is straightforward, with air conditioning and an air seat available. The top section of the floor-mounted gear levers (on earlier models) are easily broken – but straightforward to replace. Another minor issue is that the hydraulic spool levers are mounted directly to the spool valve block; they can buzz or vibrate in certain situations. The engine is hidden beneath a relatively flat bonnet, but the panels can easily be removed without tools for access during service or maintenance. Valtra tractors have a good reputation for mechanical toughness, with many older second-hand machines showing big hours and yet still commanding strong money. In Ireland, despite having a smaller market share than many competitors, they have a good market presence in certain areas. They seem to garner loyalty from their owners – both farmers and contractors. As an example, the 2000 Valtra 8050 Mega featured in these pictures has 8,300 hours on the clock. Overall, it is in very good condition. Sitting on a dealer’s forecourt, it’s priced at €20,000 excluding VAT. 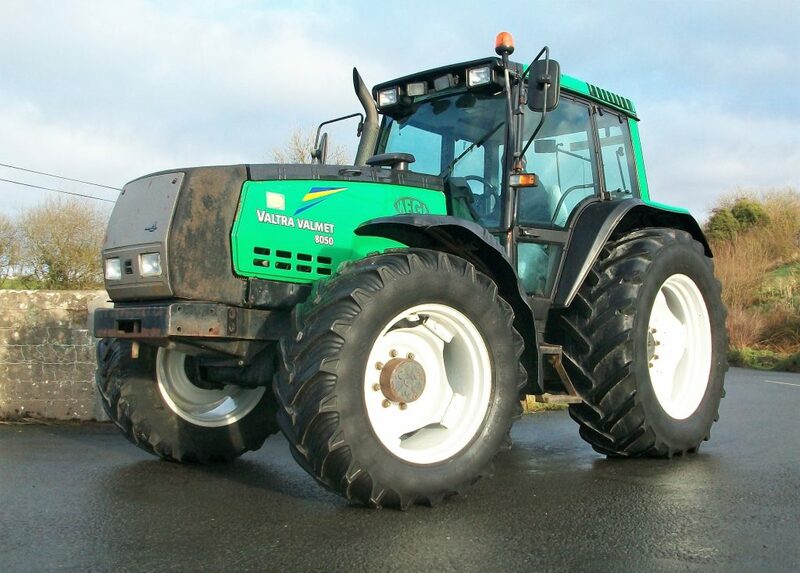 Typically, high-houred, older 8000 series tractors start at €12,000-14,000, depending on condition and tyres. 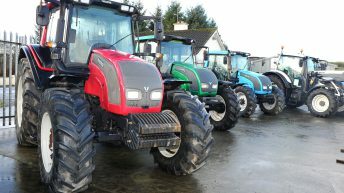 A scour of the online world reveals pristine, low-houred units with sticker prices in excess of €25,000 – indicating enduring demand for these rugged tractors. Thanks to Clarke Machinery, New Inn, Co. Cavan for its help in producing this article.